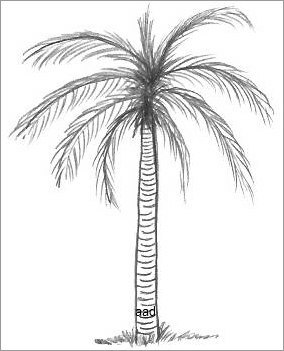 Learn here in detail about drawing of beautiful looking palm tree along with its leaves on beach. You can follow step by step and sketch with the help of pencil on your own drawing card or board. This video tutorial is demonstration for beginners and kids as well. Watch the complete video tutorial here. This video will help you a lot in making a tree of palm that look beautiful. Now after watching the video just sit down and with a copy pencil and start sketching it. Do it again and again untill you get success in drawing exactly as like palm tree as you wish to be admired. Dont sit back or give up doing so, because it is an art and this skill will be learned slowly. So do work by heart and then see results coming as beautiful drawings. Here I want to share a tip, that before sketching any thing, just imagine that figure in your mind and then draw its contour. After that move inward and complete it to be look as like you imagined in your mind. Moving ahead if you want to include a scenario in your sketching then this second video will help you in that. In this video tutorial it is depicted the drawing of seashore along with trees. Drawing looks much beautiful with scenery and view. Now here is explained the making of island along with palm trees. Now at the end after sharing a lot of tutorials, you will have a perfect over view of how you can do it and impress other with your skill. Just explore up your skills and add extra work to it. Be unique in what you create and then tell people about your success. You are welcome to share your piece of drawing with us, we will be happy to share it on our blog.